Okay, we've gotta start by pointing out that "quasic" isn't a word - it's just a "quasi-sonic" scream with an extra C on the end. A typo that made it to production. On with the review! This is mostly the same figure that came in 2014's Thanos Imperative box set, except his body (his reused body, of course) is painted in a dark blue rather than true black. It does kind of miss the point of his name (a miscommunication somewhere? ), but it's dark enough to suit him. He has the same awkward arms as the previous version, and while the silver pattern on his torso is similar, it's not actually the same paint masks - very, very similar, but the angle over the shoulders is just a little different. How weird! Ditto the head: for whatever reason, the head on this figure is a different mold than the 2014 figure - the temples are wider, the chin is more defined, and the pitchfork on his forehead sticks up farther. They could easily have stuck with the existing mold, but instead, they spent the money on a new one. Weird. And the thing is, it's not like they weren't already spending money on this guy. He comes with a second head, the exact head we asked for four years ago: a head with the mouth open in a yell. The sculpt on the open mouth is great, from the teeth and the tongue to the wrinkles on his cheeks and the jut of his lower lip. The interior of his mouth is bright blue, suggesting energy rather than plain anatomy, and his eyes are solid silver. The coolest thing, though, is the way his tuning fork changes; the sculptor created a chain of Kirby dots rising up off it, and they've been cast in translucent blue plastic to reinforce the "powerful energy" feeling. Only the base of the fork is painted (silver, naturally), while the bit visible on the back is left blue so light can come through. This is a great extra! 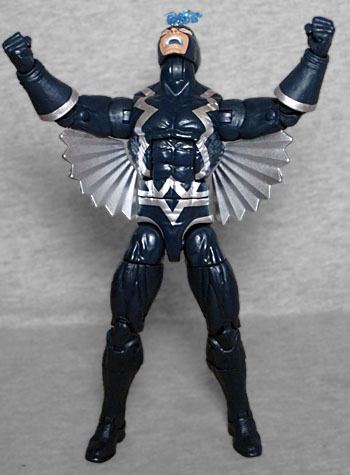 Black Bolt is part of the Black Panther toyline, so he comes with part of the Okoye Build-A-Figure. Which part? A leg part. The right leg, specifically. Other than having the word "black" in his name, Black Bolt doesn't make a lot of sense for a Black Panther line. Is that why Hasbro put him there? Is there any other logical reason? To be fair, given the failure of the Inhumans TV show, it's not like they're going to be getting their own toyline any time soon. Somebody get Marvel on the phone! This entry was posted in blog exclusive review, Hasbro, Marvel, videos and tagged Black Panther, Inhumans, Marvel Legends. Bookmark the permalink. Hasbro guys said at the SDCC panel that Namor and Blackbolt are both in this wave because they’re both kings like BP is. 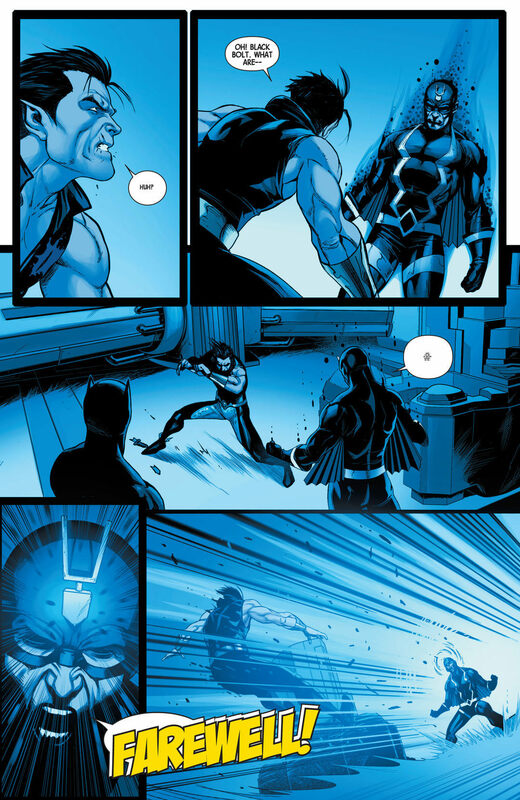 Black Bolt and Black Panther once murdered Namor. Like Panther, Stark, and Namor, Illuminati members? 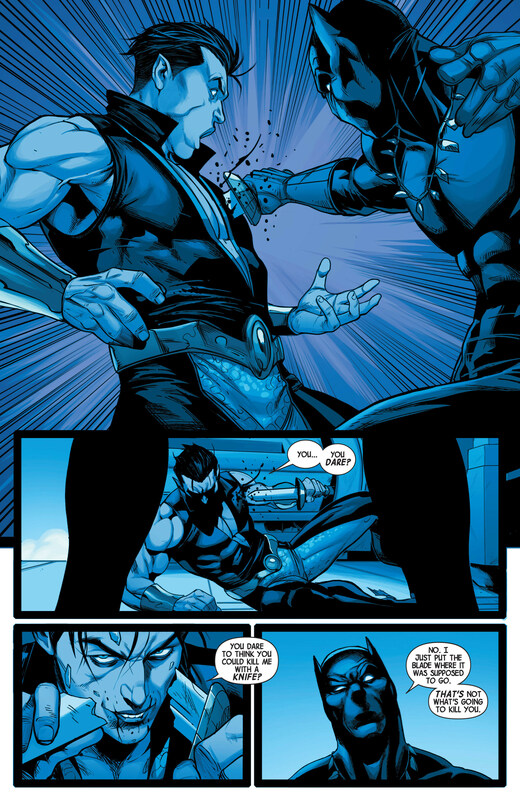 I had guessed it was the Illuminati connection to BP as to why Iron Man, Namor, and Black Bolt were in this series, but double checking online I see that BP refused to join the group. Even a quasi-sonic scream doesn't make any sense. It’s a pity that half of Black Panther’s Marvel Legends wave are tangentially related comic based Caucasian characters that could’ve stood out less in a different assortment. (The white guy who is directly relevant to Black Panther, Klaw, is exclusive to a Toys R Us 2-pack with Shuri wearing a recycled X-Men belt.) At best, they stretch the line’s royal theme with the umpteenth Iron Man, who is at least not a repaint. At worst, it looks like Hasbro didn’t have faith a line of purely BP characters would sell. Mixing movie & comic characters together is rarely ideal, but this seems exceptionally tone deaf.